Youll be looking for any excuse to go to bed when you introduce this stunning bed to your slumber space. Very modern yet upholding traditional appeal, this bed frame is wrapped in tightly woven, chenille fabric, and sits atop solid, curved chrome plated metal feet. The bed frame commands attention with its Tufted accent detail. A hint of luxury balances beautifully with this incredibly attractive bed. Awake or asleep, you love to enjoy the finer things in life. This panel-style bed frame is wrapped in light grey linen that features a lightly tufted design. It has a modern shape is clean and refined, and combines comfort and style effortlessly. Low, splayed legs raise the platform slightly while allowing the contemporary appeal to shine through. A full slat system provides the support needed for your mattress, which means you can finally say goodbye to that old box spring. The Opaci-T platform bed with contrasting headboard is the ideal start point for any bedroom. 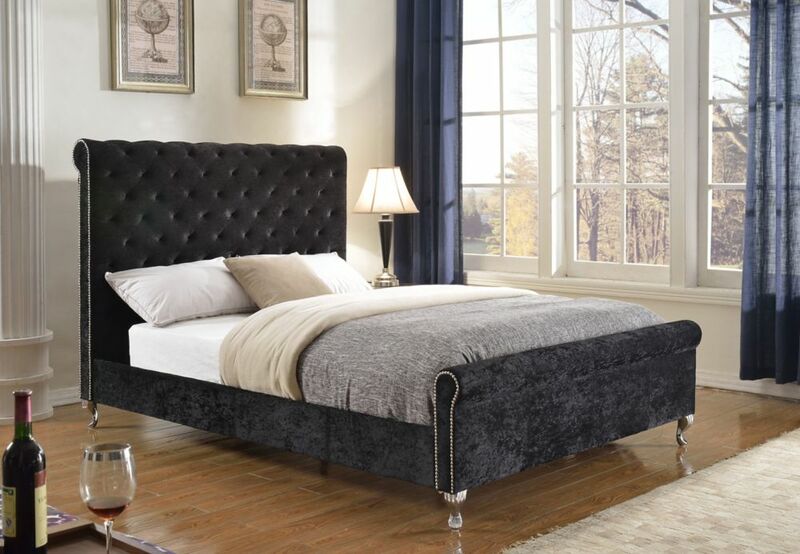 It's rustic-chic ebony and black finish makes for a trendy and timeless bedroom set. The beds unique design gives the impression the bed floats above the ground, giving the entire room an airy feel. This bed also features a unique metal and hardwood slat construction allowing for easy assembly, sturdy construction and easier handling. With its simple and smart design the District Queen Platform Bed is the perfect addition to any modern bedroom. Its Washed Black laminate fuses together classic black with warm brown undertones to create a high-end look. The composite wood construction provides a sturdy mattress foundation. Pair with the Prepac District Queen Headboard (sold separately) for a harmonized look and extra storage space. This bed ships ready to assemble and includes an easy-to-follow instruction manual. Add storage, style and comfort to your bedroom with the Prepac Select 4-Post Platform Bed. The elegant design features solid wood posts with a sleek finished bed frame. Custom hardware keeps the bed aligned and requires only your mattress. The wood slat system, which comes in two sections, prevents motion transfer to provide individual comfort. The platform is raised 8.5 inches which allows for optional under bed storage. Prepac Select Beds are also available with 2 or 4 drawers. Victoria Queen Platform Bed, Black Youll be looking for any excuse to go to bed when you introduce this stunning bed to your slumber space. Very modern yet upholding traditional appeal, this bed frame is wrapped in tightly woven, chenille fabric, and sits atop solid, curved chrome plated metal feet. The bed frame commands attention with its Tufted accent detail. A hint of luxury balances beautifully with this incredibly attractive bed.